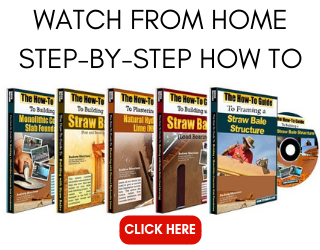 I know that the hosts of my upcoming straw bale workshop in Idaho are not the only people to love the idea of combining timber framing and straw bale construction. As such, I thought it was a good idea to share with you some details about pulling off a beautiful and durable home using both techniques. 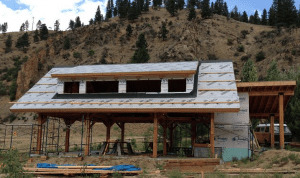 In general, the detailing of a timber frame straw bale home is very much like that of a regular post and beam straw bale home; however, the differences are important to discuss. How the bales attach to the frame and how to best seal the transition from plaster to frame are among the important details to consider. Let’s start with how to attach the bales to the frame. Because the exposed timber frame is not buried in the bale wall, the point of attachment is very different than regular post and beam homes. 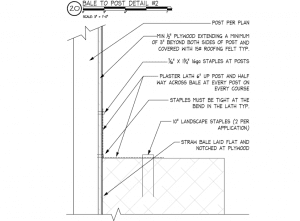 You will need to attach the bales as often as possible because the framing members are far apart from each other so each attachment is key. I suggest that you attach at every bale course and every post intersection. I use plaster lath to make L shaped points of attachment as shown in the drawing to the left. Those pieces are attached to the bale with 10″ landscape pins and stapled to the framing with structural staples (1-3/4″ long, 7/16″ crown, 16g). Be sure to staple as close to the corner of the lath bend so that there is very little room for the lath to stretch should the wall be stressed. You will notice that directly behind the frame there is a piece of 1/2″ plywood which the bales need to be notched around. This serves three main purposes. 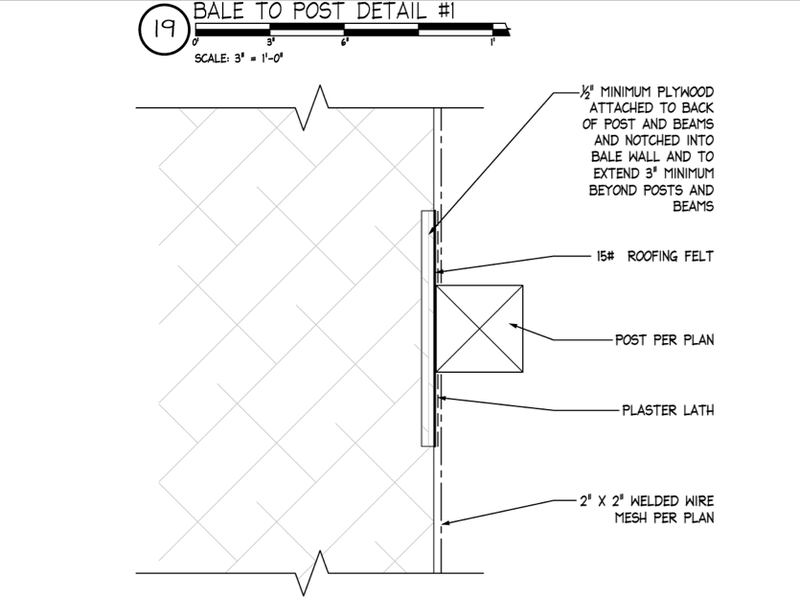 First, it provides a place to nail the field mesh (2″x2″ welded wire mesh) to provide a strong and tight bale wall. Second, it also provides nailing for plaster lath to be attached tight to the exposed frame. This will minimize cracks at the plaster to frame transition. Finally, the roofing felt that is applied to the plywood before it is attached to the back of the post will provide a vapor seal at the plaster to frame transition. I still recommend caulking this joint, but if that seal ever fails, there is a secondary vapor seal in place. You can better see how the plywood and roofing felt work in the picture to the right. Another place where the detailing is slightly different in an exposed timber frame structure is at the eave lines of the roof. Because the roof line comes down into the space occupied by the bales, it can be difficult to get a tight fit without providing additional framing. As you can see in the picture to the left, the additional framing can be used to create an enclosed soffit on the outside of the bale wall. The inclusion of a bale stop at the top of the bales helps to tighten the bale walls and stop any loose straw from piling up into the rafter space. This void is best filled with insulation, making sure to provide for tight air seals at the transitions. Spray foam, although not environmentally friendly (in general) nor specifically healthy, does a great job and providing that seal. This is something you will have to consider the pros and cons of (foam seal). If you want to complete your home with the look of exposed rafter tails, then additional framing is still needed; however, it is slightly different than what I show above. The image to the right shows how to complete an exposed tail look on a timber frame home. Other than the obvious difference in framing details, the rest remains about the same. Be sure to fill the rafter void with insulation and provide adequate air sealing as well. The last thing I will say about exposed timber frame, straw bale homes is that they are a bit harder to plaster. Because there are exposed framing members to avoid damaging and, perhaps even harder, there are angled knee braces to avoid, the overall plastering process is more difficult. The look you are left with is, no doubt, beautiful, but you WILL work for it. Also, keeping those exposed timbers clean and free of dust and cobwebs will likely be a full time job as well. That said, it sure is a beautiful look! I have a couple questions not specifically related to the blog post. Hope that’s okay. 1. Do you have any thoughts about the advantages or otherwise of a straight slab foundation compared to a waffle pod one, which has polystyrene blocks in it and hence uses less concrete. In a Victorian coastal clime (cool winters, hottish summers) is it better to be more connected to the earth (via a straight slab) or more insulated (via the polystyrene)? 2. What do you think about having a “render stop” step in the edge of the slab that is a small (35mm?) step in the slab that gives the render something to “sit” on? They recommended one at the other strawbale course I did. That is true Heinz; however, there is no connection between the two wall systems other than at the foundation and the eave. This can work, but it makes the wall less stable to be sure. 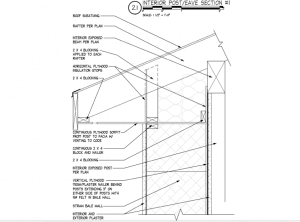 Any long wall sections, say over 30′ or so, would be unsupported and ultimately too long unless an interior partition wall was attached to the bales. It is very similar to the restrictions found in load bearing construction. Hi Peter. There are lots of advantages to each style of foundation but the real question is which is appropriate for your specific soil types. That is a question for a geotechnical engineer. I personally think that an insulated slab is a better idea than a non insulated foundation. Although the earth can provide stable temperatures, that only happens at depth so for a shallow slab, that impact may not be valuable. I have used render stops in the past and they work well, especially if you are using the plaster a shear skin. It needs to rest on the foundation in that case. If you are simply looking for a clean finish at the foundation, then I prefer the use of J channel (a plaster stop specifically designed for that use). Hope that helps. Just a quick question for an absolute beginner. Do I need any timber frame at all for a small straw bale garden shed of 126″ x 106″ approximately? You would not need one for the building to work structurally depending on the design. There are limitations to the design such as wall height and the amount of window and door openings per wall, etc. If you stay within those guidelines, a load bearing straw bale would work for you. The roof and top box beam would still be wood as would the toe ups to raise the bales off of the floor. Hi Andrew, Thanks for the reply. So does the slab normally extend out past the toe ups or do the J channels just “hang” at the appropriate depth below the top of the slab so that the render just “flows” down to them? Greetings for your efforts. This is prasanna writing from southern part of India. First i planned to start my green house dream as a bamboo house but after heard about straw bale construction i was amazed. 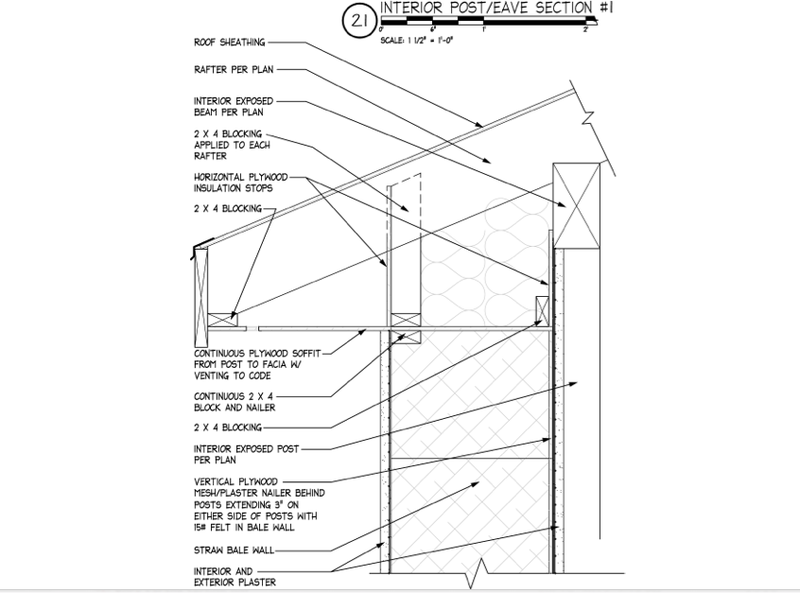 To merge this two is it possible to use bamboo as framing (post & beam) structure for straw bale house? Bamboo is incredibly strong. I know that it would not be allowed here in the States, but not because it is isn’t strong enough, but because it is not a recognized framing material in the codes. I have seen high rise skyscrapers wrapped in bamboo scaffolding in China and incredible structures built of bamboo around the world. I have no doubt that it will be strong enough for a simple straw bale structure. The question is about the construction details an dhow to actually build with bamboo. I am not an expert in that area, but I know there are folks who are. I would love to see [pictures of your build if you move forward with it. Best of success to you. 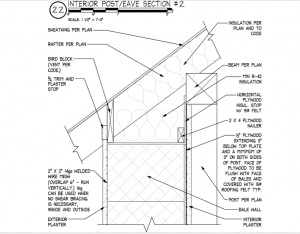 If the plaster is part of the structural shear system, then it needs to rest in a pocket in the foundation so that it can bear on the foundation when loaded; however, if it is just plaster as a finish material and/or secondary (redundant) shear, then it can be placed in J channel that simply hangs 1″ lower than the transition from foundation to frame. Hope that makes sense. I have been told that strawbale will not work here in Northern Maine: That plaster will crack in the extreme cold (sometimes gets to 40 below zero), and that the snow soaking into the walls will cause mold issues. Is it possible to build here, and if so, what kind of modifications will I have to make? Prefer timberframe, as wood is plentiful and cheap. Could you please advise? Thanks for the article. I’m wondering when doing a timber frame straw bale home are the foundation types better suited to either an envelope wall system vs. Infill? 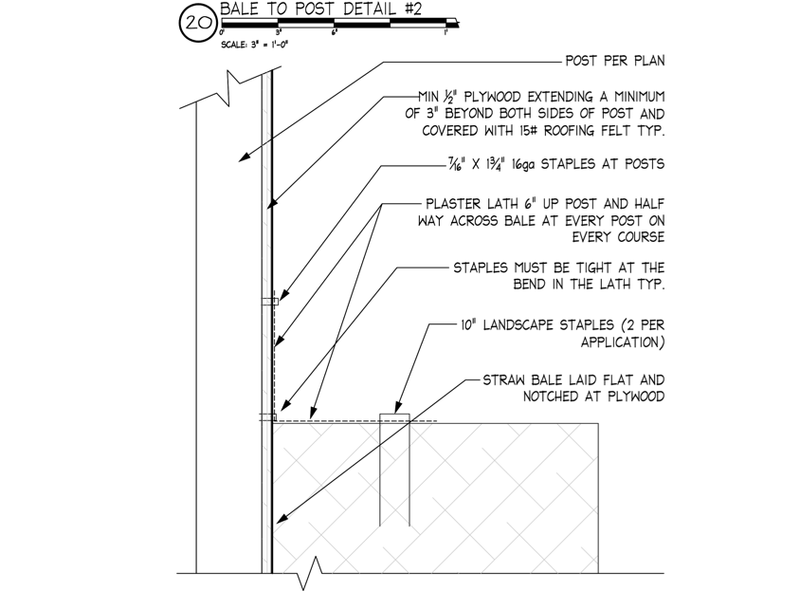 Say if I were to choose an envelope wall system for my bales would I be limited to a monolithic slab foundation because the stem wall would then have to be wide enough to accommodate the bales? Hi Dylan. I would suggest that the foundation be large enough to support the bales and the frame, but not so big as to be monolithic for the entire house. Concrete is a nasty material for our planet and doesn’t feel very good under foot. I would suggest a perimeter foundation with as much fly ash in replacement of Portland cement as your concrete company will allow (often 35% replacement) and then an earthen floor for the actual floor of the house. That will be so much better under foot for you and healthier for the planet too! Hello Andrew, Thanks for the article. 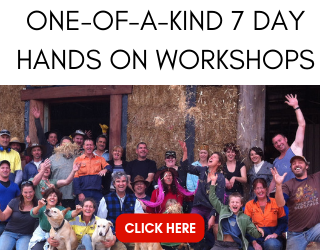 I have clients (who were your past workshop attendants) wanting me to do the timber work for their straw bale house. I do timber frame for a living but that does not mean I know what I am talking about. We talked about the issue of knee braces and having to plaster around them or behind them. I came up with a solution that I thought might be useful for your audience. I have seen diagrams of wedges in mortise at the nose of the knee brace. So the wedge makes the knee brace detachable (after removing wedge). I have built with this style since seeing the diagram (ideas originating from Scandinavia I think)… and then leaving them out slightly for decorative purposes. So removal of wedges means you can remove knee brace and plaster in behind… then replace knee brace and wedges. Very cool idea Wayne. I like it a lot. I suppose you would remove them one at a time and replace them as quickly so as not to lose plumb on the walls. Sweet option. Thanks for sharing. 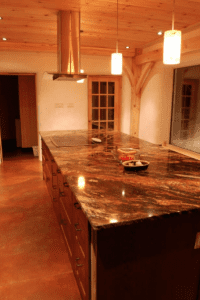 Hi Andrew, I appreciate and draw inspiration from your articles and construction details. However, can you show the foundation specs for the structure depicted above? Seeing that interface would be beneficial. Thanks. 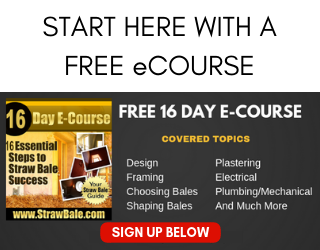 Hi Andrew, I’m in the process of planning my own house (timber frame and bale wrap) and the question I’m trying to answer now is how to interconnect the bales? How it was done on that job – mortar, pins? Based on Serious Straw Bale book I have incline towards mortar. Many thanks. Hi Krzysztof. Just seeing this now (having responded to your email already) and feel it’s good to share my answer with the group. I do not use pinning or mortar. Those methods are outdated. I use the welded wire mesh on both sides of the wall to create out of plane strength (and lots of other strength too). 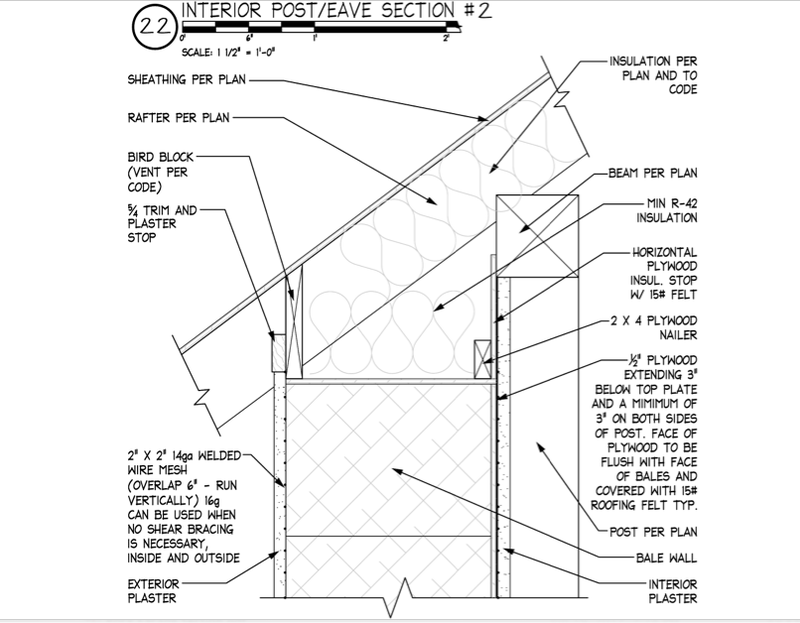 Solid attachment at the posts (either notches around the post or a tight fit against a modified post and beam structure) and the mesh work together to create a VERY strong wall.